Reception children mount an attack on Clitheroe Castle! 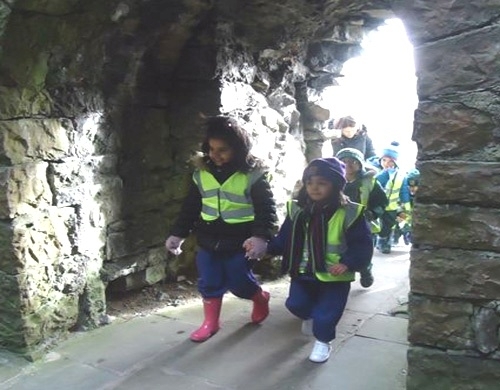 The Reception children had a wonderful time visiting Clitheroe Castle. In the morning they looked around the castle keep and learnt about the walls, arrow slit windows, dungeon and entrance to the castle. They also found out more about Motte and Bailey Castles and built their very own in the sand! The children had to remember to add a moat, a palisade fence, a keep and a range of houses for the people living in the Bailey. After lunch they embarked on the afternoon’s activities surrounding Myths and Legends. They learnt about the different dragons that like to live near Clitheroe Castle as well as becoming ‘Rangers of the S.W.O.R.D’. The day was rounded off by listening to a story teller. Everyone had a fantastic day; the children can’t wait to continue their castle topic in school!